We started building our house in 2004. 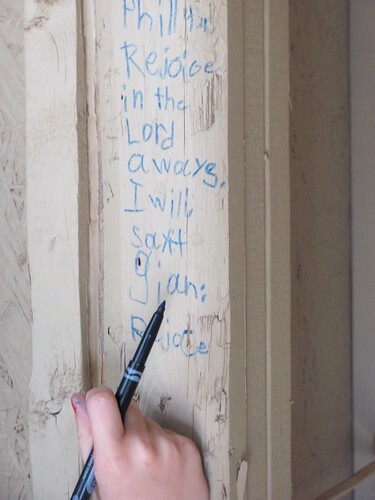 At the time I told Jeremy that when we were in framing stage I wanted to go over and write scriptures on the walls. But soon after construction began I got pregnant with Emery. And soon after that, within minutes I think, my “all day morning sickness” began. And soon after that, we got a contract on our house that we were living in. And soon after that, between puking and taking care of a 2 year old, I started packing boxes. Needless to say, I missed the framing stage. Now our house is down to the studs once again. 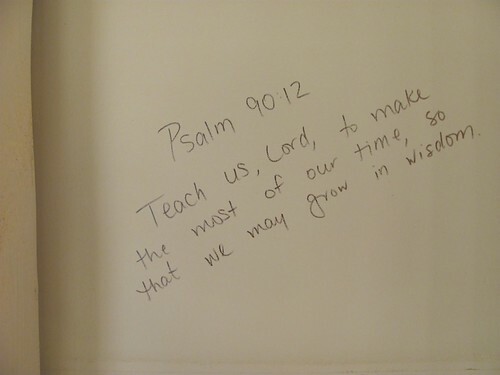 I was determined not to miss out on my second chance to cover the walls of our house with God’s word. So a few days ago, I asked the kids, “Who wants to write on the walls?” They looked at me like an alien must have invaded their mother’s body. Then I explained what we were going to do. We all wrote down some of our favorite verses and headed over to the house. 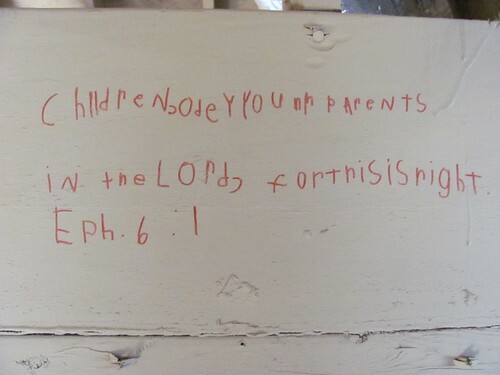 We are memorizing Ephesians 6 this year for school, so Emery chose to write the first verse in his bedroom closet. “Children obey your parents in the Lord, for this is right”. Savannah picked 2 verses for her room. One was the first verse she ever memorized, Phil 4:4, “Rejoice in the Lord always; I will say it again, Rejoice!” And also 2 Peter 3:14 “So try your best to be found pure and without blame”. I don’t know how many I ended up writing down, but I do know that I wrote at least one verse in every room. It gives me great peace knowing that we will now be living within the walls that are covered in Truth! I love this!…and I love you all. This is awesome!! I know y’all will be excited to be back in your home!! What an awesome idea! What a peace to know that God’s word will surround you while you are within your home. What an amazing idea!!! If we ever build, this will happen for our home too! 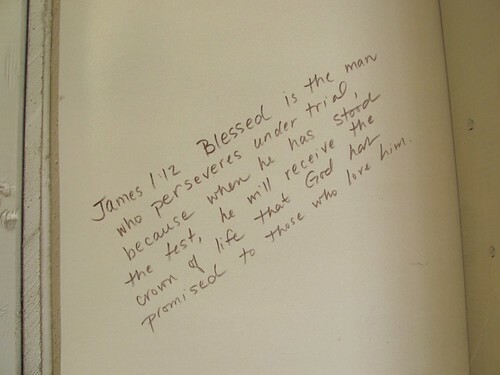 I love the scriptures you picked and to have the kids write theirs in their own handwriting….WOW! I really love this idea! And Thank goodness she’s blogging again.